Once you have a business plan in place, the next thing is to prepare your working station. To look professional, you should have a room that is exclusive to trumpet lessons. You need to equip it with the necessary equipment such as trumpets, sound systems, computers, and music stands among others. Start by buying a course book. This will help you with preparing the learning schedule. Next, buy the trumpet exam books and get familiar with them. In addition, you can choose to stock free notebooks to offer your students as motivational material. Since you already have a course book, it’ll be easy to draw a training timetable. It helps the students to decide what time is best for them to practice the trumpet. You are also able to create some spare time for your personal activities. You need to come up with a charging plan for the business. You don’t have to be too flexible as it may limit your earnings. Lastly, you need to promote your trumpet lessons to attract students. You should consider creating a website and using avenues such as posters, social media, and word of mouth. These basic tips are what you should follow to start offering trumpet lessons at home. This will guarantee you some extra cash and you can decide to do it full-time or part-time. 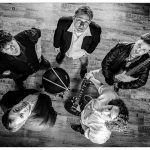 If you are looking for a jazz to perform at an occasion you are hosting in Sydney, you should know one or two things about jazz music before you begin your search. Jazz has been described as a flexible, timeless and innovative brand of music. 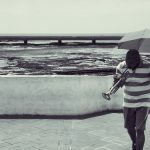 All these things are true about jazz but the adjectives above do not quite capture the enchanting essence of this genre of music. Jazz music is great music and if you want to hire a jazz band, you should go for a band that has top class musicians and instrumentalists. This one way to ensure that the occasion you are hosting will be successful. Fortunately, Sydney jazz bands have great musicians that can make your party come alive. Below are some things to look out for if you want to hire a jazz band in Sydney. There is no substitute for experience in the music industry. You do not want to hire a band that needs your supervision. What you need is a band that has been performing live for years. The individuals in the band understand each other and everybody knows his or her role and plays it to perfection. This is the right band for you because they will deliver the goods. A jazz band is nothing without musical instruments. Bands that play folk music or roots reggae may get by on a few basic instruments but this is not the case with jazz musicians. Jazz music requires all the right drums, guitars, keyboards, wind instruments and other vital sound-enhancing devices. Hire a band that has all the right instruments and they will give you exactly what you need. For some musicians, playing music is just a job. Clearly, this is not the right attitude because there is no commitment here. You need a jazz band with members who are truly committed to music. Jazz music is not just a job. It is a calling and only those who see music as a calling will go the extra mile and put on a great show for you. Hire committed musicians and your occasion will be a huge success. Jazz has many sub-genres and some jazz band specialize in just one or two of these sub-genres. If you want to hire the right band, you should choose carefully. There is no point in going for a jack-of-all trade when you can hire a specialist. Choose the band that can play the type of music you want and they will raise the roof. There are many jazz bands in Sydney but you should choose the one that is just right for you. Follow the tips above and you will get a great jazz band. Trumpets are among the most well-known musical instruments yet it is also one of the least understood. People are aware that it is a wind instrument that you would need to blow on and control through valves. Apart from these, the public is quite clueless. This is unfortunate as trumpets are actually incredible devices that have proven to be extremely useful throughout history. Let us take a close look at this highly creative human invention to figure out what makes it so special. Perhaps you can walk away with renewed appreciation for the apparatus and even consider taking formal lessons. The first thing that anyone will notice upon hearing a trumpet up close is its volume. These can be extremely loud. Unlike guitars, you don’t need any amplifiers or other contraptions to increase the volume. The sound can fill a whole arena by itself. This is exactly the reason why these were used in fields of battle hundreds of years ago. They could be so loud as to overpower even the drums. This ensured that command signals could be heard by the entire army in an open field where human voice would hopelessly dissipate in the wind. In modern concerts, these may be heard by the whole arena with impressive clarity. Trumpets may seem like simple contraptions but they are actually quite complicated and extremely versatile. Sure, they don’t have the range of a grand piano but they can hold their own when it comes to musicality. Flutes have several holes and clarinets have many more valves to press but these differences do not matter. There are only three valves in most cases but these can be manipulated into producing up to 45 notes. They are good enough to play the melody in most ensembles, providing a strong resonant sound for the rest of the musicians to follow. They can be played for almost any musical genre from jazz to pop to rock. They are also small and easy to transport. Use them indoors or outdoors with no worries. While the instrument is naturally loud, it takes a great deal of skill and experience to take it to the heights of its potential. 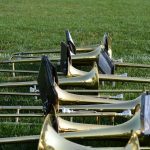 Seasoned players put a lot of energy into every performance because trumpets are extremely demanding. Facial muscles get a massive workout as players try to pump out strong and resonant notes in sequence. Unlike electronic devices, the sound is never synthesized and each note requires hard work. Trumpeters also need to be aware of the other instrumentalist and adjust accordingly to their pace.